The Contemporary Jewish Museum in San Francisco focuses on the history, art, and ideas of the Jewish community. It's a non-collective museum, which means the majority of their exhibits are only on display for a limited amount of time. This allows them to offer a dynamic experience with the most relevant exhibits on display. It also gives you an inside look at today's most important topics for this community. The building that houses this museum is a mix of new and old. The original brick structure was built in 1907 and was used as a PG&E Substation for a number of years. 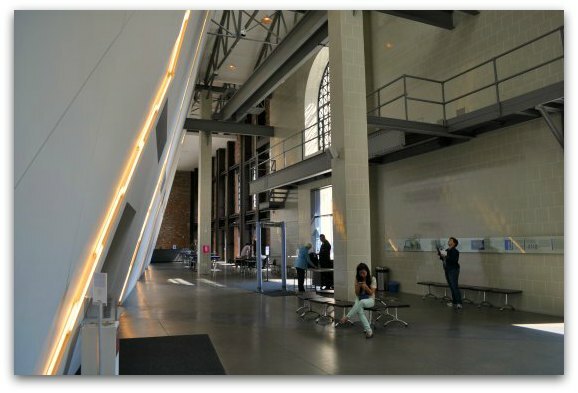 During the transformation of this building, modern architectural pieces were added, making it a beautiful and unique addition to the SF museum scene. The Jewish Museum in San Francisco is a wonderful experience. You will find it in the South of Market District near several other top museums and hotels. I love stopping by to check out their current selection. I usually spend about two hours here, although sometimes I spend up to 3 hours depending what's on display. The museum is CLOSED the first day of Passover, July 4, the first day of Rosh Hashanah, Yom Kippur, Thanksgiving, and New Year's Day. The museum is OPEN on Christmas Day, December 25 from 11am to 4pm. You can either pick up your tickets in advance online or at the door. You can also gain discounted admission to the Contemporary Jewish Museum in San Francisco through the Go Card. This discount pass, created by Smart Destinations, offers discounted admission to this museum as well as others such as the California Academy of Sciences, the de Young, and the SF Museum of Modern Art. You purchase the card based on the number of days you plan to use it. It's offered for one, two, three, and five days. It's a great way to save up to 50% on admission to a variety of museums and attractions all around San Francisco and the Bay Area. 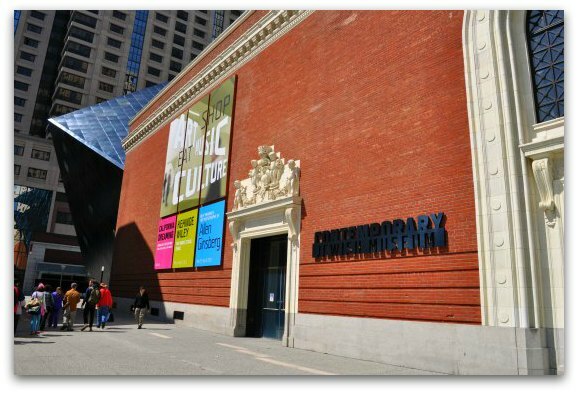 You can also gain free admission to the Contemporary Jewish Museum in San Francisco on the first Tuesday of the month. They offer free admission to all of their exhibits on this day. It's a popular day to visit, so make sure to arrive early to get your spot in line. Photography is only allowed in the lobby. No photography is allowed in the exhibits or in the store. Do you want to learn more about a certain exhibit? Every day, they offer two to three free tours. The first one usually starts around 11:30am and lasts for about an hour. The second tour starts around 1:30pm. On Thursdays, there is an additional tour offered around 5pm, as the museum is open later. Make sure you ask about their free tour schedule for the day of your visit. The Jewish Museum in San Francisco is a non-collective museum. This means they do not have a permanent collection. All of their space is dedicated to traveling exhibits. They offer exhibits created by Jewish painters and other artists. They also feature exhibits about Jewish history, culture, and other modern day topics. Many of their exhibits are multi-media displays with memorabilia, televisions, and/or paintings. You will find three to four exhibits at the Jewish Museum in San Francisco at all times. This also means you can visit again and again and have a unique experience. Find a full schedule of upcoming exhibits on my calendar. It also includes traveling exhibits for other museums such as the de Young, the SF Museum of Modern Art and the Legion of Honor. The Jewish Museum in San Francisco started as a small attraction near SF's waterfront. It lived in it's first home for almost 24 years. After years of planning and construction, they moved to their current home in 2008. The Contemporary Jewish Museum in San Francisco sits inside the historic Jessie Street Substation. This beautiful building was completed in 1881 and went through a renovation in the early 1900s designed by Willis Polk. He added lovely details both inside and outside this building. Shortly after this renovation, it was severely damaged in the 1906 Earthquake and Fire. They requested the help of Polk a second time to bring it back to life. It's been on the National Registry of Historic Places since 1974. The most striking addition to this gorgeous brick substation added by the Contemporary Jewish Museum is a modern element designed by Daniel Libeskind. It includes 3,000 shiny blue panels with several windows. Many people stop by just to look at this work of art from the outside. You will find several places to park near the Contemporary Jewish Art Museum. Here are a few places I recommend. All are within just a couple of blocks of this SF museum. Parking prices below are estimates and can change at anytime. Sometimes prices will increase during large events, but this is the typical daily rate. 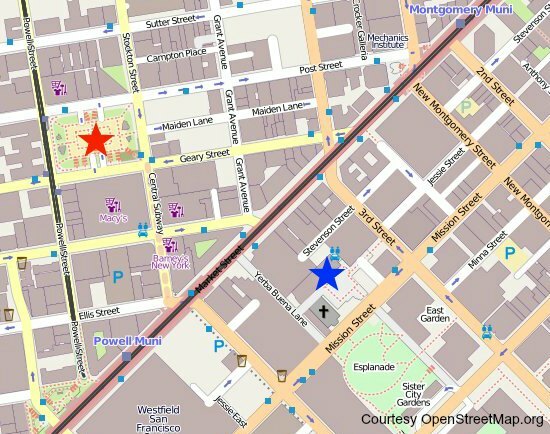 Jessie Square Garage: This is the closest parking nearby the Contemporary Jewish Museum in San Francisco. Rates start at $5 an hour and up to $25 for 12 hours. Their daily maximum is $35 for up to 24 hours. The address is 223 Stevenson Street. Fifth & Mission Garage: This is the lot I usually park at when I'm in this area. It's a huge lot and only about two blocks away from the museum. Prices run from $1.50 to $3.50 an hour. You will find it at 833 Mission Street. St. Regis Hotel: This garage is also close to the museum, but is a bit pricier. Rates start at $15 per hour and $10 per hour after that. The rate is $54 for 5 hours and up $60 for 24 hours. 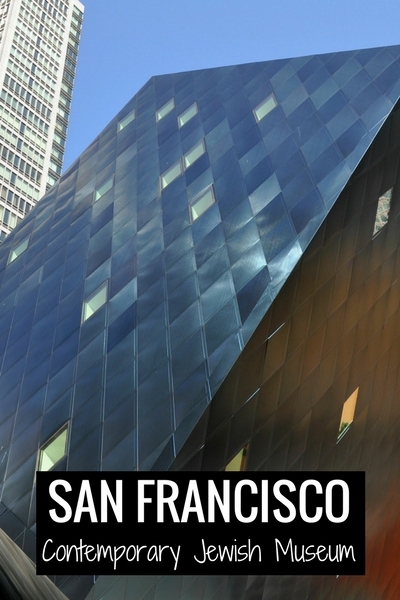 The Contemporary Jewish Museum in San Francisco is in the heart of the action. It's located in the SOMA district, but not too far away from Union Square. Both districts have dozens of hotels to choose from. Here are just a few options to get you started. St. Regis: One of the top hotels in San Francisco is the St. Regis. This 5-star hotel offers luxury accommodations just two blocks from the museum. Find recent guest reviews and pricing. The Park Central: Just a couple of blocks away is another highly rated hotel, the Park Central. This 4-star gem offers all of the top amenities and is in the perfect location. It's at 50 3rd Street. Read recent guest reviews. Marriott Marquis: A block to the west of this museum is the Marriott Marquis. It's also a four-star hotel with clean rooms and a convenient location. Make sure to head up to the The View Lounge for some amazing views of SF. It's located at 780 Mission Street. Read recent guest reviews. Find additional options in the Union Square and downtown SF districts. The Contemporary Jewish Museum in San Francisco (blue star) is in the South of Market neighborhood. It's only about a 5 minute walk from Union Square (red square). If you are coming over from Fisherman's Wharf, take the F Street car line to the stop at 3rd/Kearny and Market. Walk one block south and take a right. You will see the museum on your right at 736 Mission Street. What else can I help you with as you plan your visit to the Contemporary Jewish Museum in San Francisco? California Historical Society: In addition to the Jewish Museum in this district, you will also find the California Historical Society. This small museum showcases photography and other exhibits about the history of San Francisco and the State of California. Asian Art Museum: This Asian Art Museum is one of my all-time favorites. They have an amazing collection of artifacts and other pieces from China, Japan, and Korea. You can also find rare pieces from Bhutan, Malaysia, and Indonesia. It's worth a visit and it's one stop you will not soon forget! California Academy of Sciences: The California Academy of Sciences features four areas that are each as large as most museums. During your visit, you will see the Steinhart Aquarium, the Natural History Museum, the Morrison Planetarium, and the Four-Story Rainforest. I also recommend that you check out their Earthquake Exhibit to feel what it's like to be in an earthquake and visit Claude, the rare white Alligator.